Born: 21 April 1619, Culemborg, Netherlands. Died: 18 January 1677, Batavia (Jakarta), Indonesia. 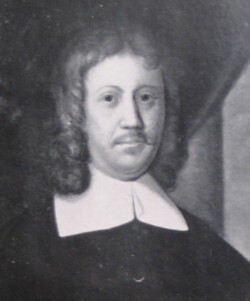 Johan (Jan) van Riebeeck, first commander of the Dutch colony at the Cape of Good Hope, was the eldest son of Anthonij van Riebeeck, a ship's surgeon, and his wife Elizabeth van Gaesbeeck. Both parents were members of prominent families. Young van Riebeeck probably accompanied his father on journeys to Spitsbergen in 1636 and the West Indies the next year. He completed a medical apprenticeship early in 1639. In April that year, then just 20 years old, he sailed for Batavia (now Jakarta, Indonesia) as assistant surgeon in the employ of the Dutch East India Company (DEIC). After being shipwrecked on the coast of Sierra Leone he reached Batavia in July 1640. For some time he worked as a clerk there, travelling with a party to Sumatra in 1642 and receiving promotion to junior merchant that same year. In April 1643 he accompanied a trade mission to Japan. From the Dutch East India Company's trading station near Nagasaki he was sent to Tonkin (now part of North Vietnam), where he learned to speak the Tonkinese language. He was promoted to merchant in December 1646. Late in 1647 he was recalled to Batavia for indulging in private trade. On his way back to the Netherlands in 1648 the fleet with which he was travelling touched at the Cape and picked up crew members and goods of the ship Haerlem which had stranded there the previous year. Back in the Netherlands van Riebeeck wrote a detailed report on the trade in Tonkin for the DEIC, but lost his post. On 28 March 1649 he married Maria de la Queillerie, with whom he had several surviving children. In December 1651 Van Riebeeck was appointed head of the new victualling station that the DEIC wished to establish at the Cape of Good Hope. He arrived in Table Bay on 6 April 1652 in command of three ships. A fort was completed under his supervision in December 1653. He governed the station wisely, was a hard worker and a good organiser. However, despite his wish to resume his career in the East the company kept him at the Cape for ten years. He was promoted to commander of the settlement in April 1654. As the founder of the first European colony in what is now South Africa, Van Riebeeck initiated, supervised, and reported on various scientific and technological activities and thus played a significant role in the advancement of science and technology in South Africa. The following examples are based on the journal in which the day-to-day activities of the colonists were recorded (Thom, 1952-1958). On 28 April 1652, three weeks after their arrival, Van Riebeeck and his staff selected a suitable site for a garden and instructed the first gardener at the Cape, Jan Boom, to start sowing. The first vegetables became available on 10 June. Wheat was sown on 3 July 1652, barley on 10 August, and both grains were harvested in December and January. On 26 December 1652 the first butter was churned. Van Riebeeck personally recorded the best times for sowing and harvesting in the form of De hoveniers almanack (The nurseryman's almanac), which he eventually handed over to his successor. Experimental plantings of wheat were used to find places where the crops would not be destroyed by the fierce south-easter. Viticulture was established by planting vines obtained from various countries and on 2 February 1659 the first grapes, mainly muscadel and other white grapes, were pressed to make wine. On his own farm, Boschheuvel, he cultivated grain, vines, citrus trees, bananas, olives, and various other fruit trees. The first two lemons were picked on 25 July 1661. He also exerted himself in sowing and planting useful indigenous plants such as wild asperagus, sorral, mustard seed, leek, wild almond, and reed for thatching. Efforts were also made to cross the indigenous fat-tailed sheep with Dutch sheep to obtain a better breed. Van Riebeeck noticed that the exploited natural forests at the Cape regenerated only slowly and decided that fast growing tree species should be imported to meet the need for timber and fuel of the colonists and passing ships. Seed, trees and shrubs were obtained from various countries. Efforts to plant pine and oak trees imported from Holland initially met with little success, but by 1661 alder were well established. Common oak appeared best suited to the colony's needs and was adopted for general use. The first forestry regulation, restricting the cutting of yellow-wood trees, was issued on 12 October 1658. Regular contact between the settlers and the local Khoi (Hottentots) meant that much information about the local tribes was recorded. As a result Van Riebeeck's journal has been described as "an invaluable sourcebook on the disposition of the various Khoisan groups in the vicinity of the Cape Peninsula and the neighboring region" (Tobias, 1985, p. 3). In some respects the colonists regarded the medical skills of the Khoi as superior to their own, for example, when a case of snake bite occurred on 22 November 1658 Van Riebeeck wrote that he would have preferred the Hottentots to treat it, but they were unfortunately not in the vicinity. On 14 December 1658 an autopsy was performed by the chief surgeon and his assistant, on a patient who had died three days after being attacked by a wood cutter who had escaped from detention. As the interior of South Africa was unknown to the colonists, various attempts were made to explore it. Although the motivation for sending out expeditions was mainly to barter for cattle and to find mineral deposits, geographical knowledge was also gained. The expeditions usually consisted of small parties of volunteers with a leader appointed by Van Riebeeck. Jan Wintervogel led an expedition northwards in February-April 1655. Its members were the first colonists to encounter a group of Bushmen - described as persons of small stature who did not have cattle. Abraham Gabbema's expedition of 1657 discovered the Berg River. Jan van Harwaerden's party reached the Roodezandskloof in 1658. Jan Dankaert reached the Olifants River during September-December 1660, while Pieter Cruijthoff, who set out in January the next year, was the first to make contact with the Namaquas. Only days later Pieter van Meerhof proceeded northwards to learn more about the Namaquas but had to turn back because of lack of water. During November 1661 to February 1662 Pieter Everaert failed to reach the Namaquas for the same reason. Meanwhile Saldanha Bay and St Helena Bay had been explored and mapped by ships. Efforts were made to find useful minerals and on 6 Februar 1654 a small amount of what was thought to be silver was smelted from a piece of rock. However, the ore later proved to be worthless. The journal also contains a brief description of the weather on each day, representing the beginning of systematic weather observations in South Africa. Some astronomical observations are also included. For example, On 17 December 1652 Van Riebeeck described a comet, three days before it was officially discovered by the German astronomer Johannes Hevelius at Gdansk (Thom, 1952, Vol. 1, p. 115n). The colonists had many close encounters with animals. Hence animals are often mentioned, and sometimes described, in the journal. For example, an encounter with a rhinoceros occurred just three weeks after their arrival, and a porcupine was described on 31 July 1656. Altogether 18 mammals, 10 birds and some fishes and other small animals are mentioned. Many of the records of mammals were reviewed by Skead (1980) and form part of the evidence that can be used to reconstruct the distributions of mammals at the Cape in the mid-seventeenth century. Also included are the earliest known reports of freshwater fishes in South Africa (Skelton & Skead, 1984). One kind of fish was caught in the Berg River (26 October 1657), the other in the Olfants River (8 December 1660). They were probably the Cape whitefish (Barbus andrewi) and the Clanwilliam yellowfish (Barbus capensis). Van Riebeeck was succeeded by Zacharias Wagenaer and left for the Dutch East Indies on 8 May 1662. He served as commander of the settlement at Malacca (now Melaka, Malaysia) until September 1665. His wife died there of smallpox in November 1664. He next accepted an appointment as secretary to the Governor-General-in-Council of India, remaining at Batavia for the rest of his life. A complete edition of his journal, Daghregister gehouden bij den oppercoopman Jan Anthonisz. van Riebeeck (3 vols), with annotations by D.B. Bosman and H.B. Thom, was published by the Van Riebeeck Society during 1952-1957. An English translation, edited by H.B. Thom (1952-1958) was also published. Joubert, D.M. Die groei van die wetenskap in Suid-Afrika - die biologiese wetenskappe. In: Die ontwikkeling van die wetenskap (pp. 3-23). Pretoria: SA Akademie vir Wetenskap en Kuns, 1979. Keet, J.D.M. Historical review of the development of forestry in South Africa, c. 1972. Electronic copy received from Forestry Scientific/Technical Services, Knysna, January 2011. Skead, C.J. Historical mammal incidence in the Cape Province. Vol. 1: The western and northern Cape. Cape Town: Department of Nature and Environmental Conservation, 1980. Smith, F.H. Die eksploitasie van die Kaapse houtbronne (1652-1900). South African Journal of Cultural History, 1995, Vol. 9, pp. 89-103. Thom, H.B. (ed.) Journal of Jan van Riebeeck (3 vols). Cape Town: Balkema, 1952-1958).